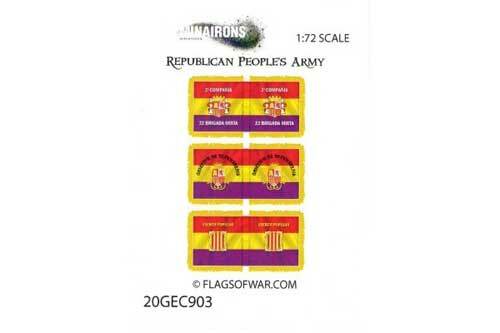 Decals & Flags There are 13 products. 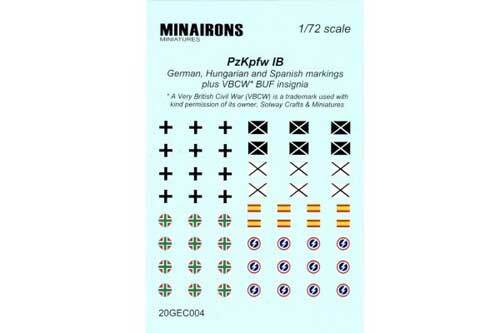 Sheet containing 1/72 scale waterslide decals for up to 4 German, Spanish Nationalist and Kuomintang Chinese Panzer I Ausf. A tanks --also suitable for other similarly sized AFVs. 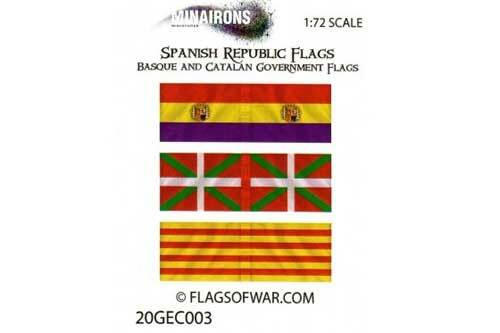 Sheet showing 3 Republican textured paper flags at 1/72 scale --that of the Spanish Republic itself, as well as of the Catalan and Basque Governments. 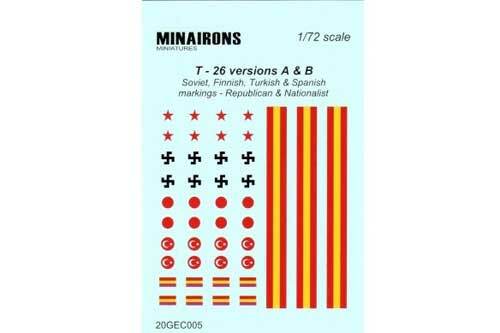 Sheet containing 1/72 scale waterslide decals for up to 4 Soviet, Finnish, Turkish and Spanish (both SCW sides) T-26 mod. 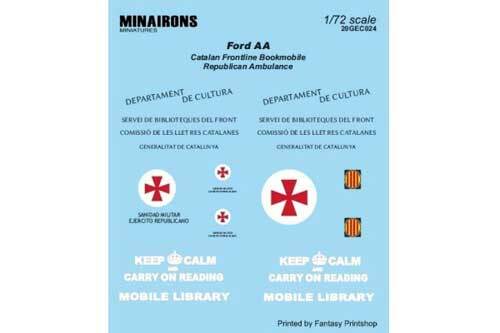 A or B tanks --also suitable for other similarly sized AFVs, such as BA-3 or BA-6 armoured cars, or BT-5 fast tanks. 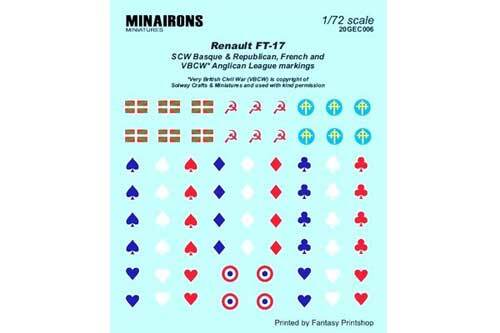 Sheet containing 1/72 scale waterslide decals for several SCW Basque & generic Republican, WWII French and VBCW Anglican League AFVs. 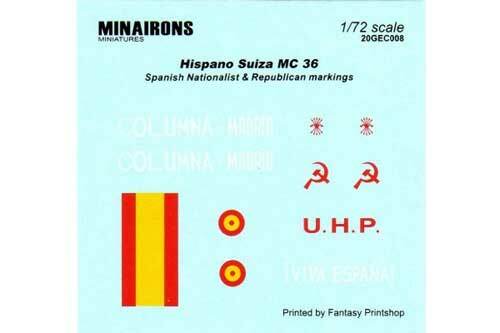 Sheet containing 1/72 scale waterslide decals for up to 3 different Hispano Suiza MC-36 armoured trucks --2 Nationalist, 1 Republican. 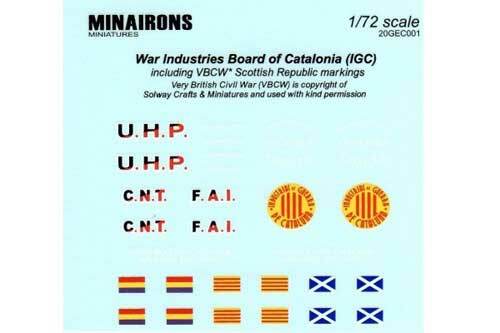 Sheet containing 1/72 scale waterslide decals for building a Ford AA van as either a Catalonian frontline bookmobile, a Spanish Republican ambulance or a fictional, humouristic British bookmobile. 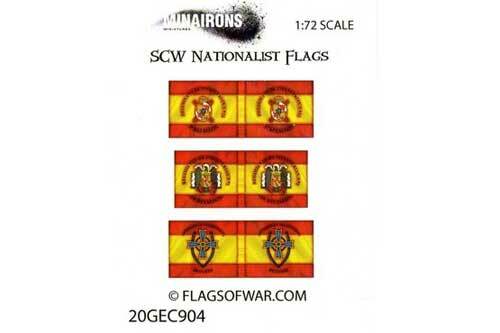 Sheet showing 3 textured paper historical flags of the Nationalist Army at 1:72 scale. 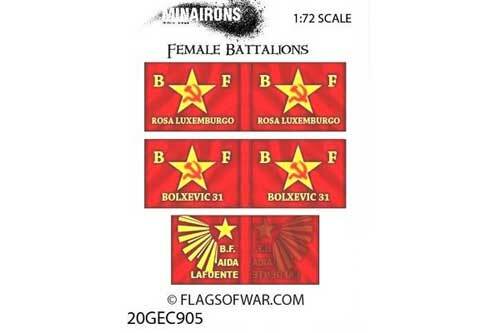 Sheet showing 3 textured paper historical flags of Republican Female Battalions at 1:72 scale. 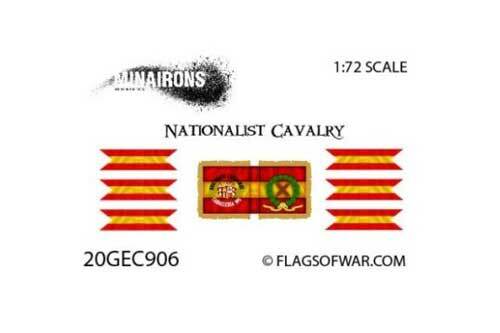 Sheet showing 1 textured paper historical standard of a nationalist Cavalry Regiment, along with several banners at 1:72 scale.